Though there are some cold-hardy palm trees, most varieties of these trees are tropical or sub-tropical and require nutrient-rich, acidic soil to thrive. Palm trees may be planted in the ground or in containers, but in either situation, soil should be properly prepared before planting. In the months immediately after planting, giving a palm ample water is critical and the soil around the new tree should be moist at all times. 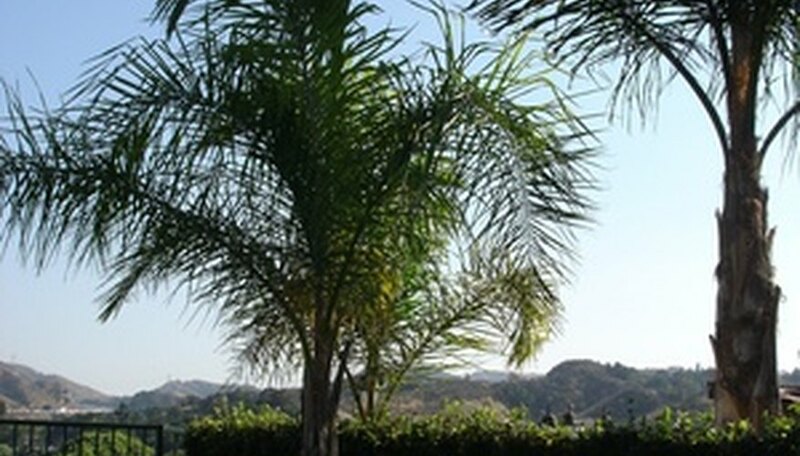 After established, most palms are nearly drought resistant. All palm trees need well-draining soil that is rich in nutrients. The more coarse the soil, the better it drains. A soil that is a combination of 20 percent sand, 40 percent rich topsoil and 40 percent organic materials, including mulch, would be a good mix. If planting in the ground, soil should be prepared a few weeks before planting and should be compacted to remove the air from the soil. Palms have developed a symbiotic relationship with mycorrhizal fungi, which is found in many plants, but is often lacking in urban environments. This fungi helps to colonize palm tree roots deep into the ground, allowing the trees to withstand difficult weather conditions, including drought or extreme temperatures. Mycorrhizal fungi lives among the roots of palm trees and passes minerals and moisture along to the root system. This fungus is available in granular form and may be added to the soil around a palm tree at any time. Palm trees thrive in soil with a pH between 6.0 to 6.5, which is slightly acidic. Neutral pH is 7 on a scale of 0-14, and soils with a pH below 7 are considered acidic, while soils with pH above 7 are considered alkaline. A pH between 6.0 to 6.5 has nitrogen and phosphorus readily available to the plant. When planting a palm tree, test the soil in the area it will be planted with a test kit from your local garden shop. You may reduce the acidity in soil by adding lime or increase the acidity by adding sulfur.